TouchWood Editions has been publishing books of literary merit about Canada’s West for more than twenty-five years. They are committed to producing quality books about the people, places, landscape, food, art, and culture that define this beautiful region. Their titles include stunning books on the visual art of BC, page-turning mysteries, and many other books of fiction and non-fiction that represent the community of western Canada. TouchWood Editions is proud to promote their books throughout Canada and the US. Cyber warfare, government conspiracy, the shady underbelly of professional sports, and murder in 1884—TouchWood Editions has a mystery for everyone! 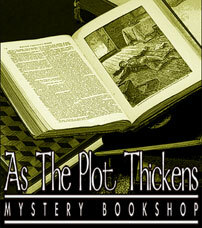 Visit www.touchwoodeditions.com for more information about these and other great mysteries from TouchWood Editions. A step back into time...the quintessential mystery book browsing experience in a shop echoing the Victorian era of Sherlock Holmes and Charles Dickens. We specialize in mystery, crime, detective, suspense, espionage and Sherlockian fiction with a selection of historical and military adventure thrown in for good measure. We market new books only. In addition to the considerable selection of books we have in the shop, special orders are always welcome. Major credit cards (VISA, MasterCard, Amex) and debit cards accepted. We are located in Historic Downtown Kingston (recently designated a UNESCO World Heritage Destination) just steps away from City Hall, Market Square, Historic Inns, major hotels, restaurants and shops. Tuesday through Saturday 9:30 a.m.- 5:30 p.m.
Cheryl has been an editor for almost 15 years and has worked on manuscripts in areas ranging from occupational health and safety to practical Kabbalah to memoirs to educational theory to crime fiction manuscript evaluations and edits. Cheryl is one of the original Bloody Gangsters whose involvement with Bloody Words (as either publications chair or conference chair) goes back to the first BW in 1999. Fondly – or perhaps not so fondly – known as Mothership and She Who Must Be Obeyed, she was also executive director of Crime Writers of Canada for almost 10 years and knows where all the bodies are buried. In addition to editing, Cheryl does desktop publishing, including program books for Bloody Words, SF Contario, and the 2003 World Science Fiction Convention, as well as all CWC publications while she was executive director. Between paying gigs, she’s working on two crime novels simultaneously because sometimes she feels like writing humour and sometimes she feels like writing literary. Cunningham's reviews have appeared in several print and online publications in Canada and the US.